This morning the court begins the second week of the March sitting with two oral arguments. First up is PDR Network, LLC v. Carlton & Harris Chiropractic Inc., which asks whether the Hobbs Act, a jurisdictional-channeling statute, requires courts to accept the Federal Communications Commission’s interpretation of a statute allowing recipients of “junk faxes” to sue the senders for damages. Christopher Walker previewed the case for this blog. Luís Lozada and Isaac Syed have a preview at Cornell Law School’s Legal Information Institute. Today’s second case is The Dutra Group v. Batterton, which asks whether punitive damages are available in a suit alleging a breach of the general maritime duty to provide a seaworthy vessel. Joel Goldstein had this blog’s preview. Basem Besada and Isaac Idicula have a preview for Cornell. 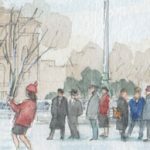 For The Wall Street Journal, Brent Kendall and Jess Bravin report that Rucho v. Common Cause, from North Carolina, and Lamone v. Benisek, from Maryland, two partisan-gerrymandering cases that will be argued tomorrow, “present the court with several different constitutional arguments against gerrymandering, much along the lines of Justice Stephen Breyer’s suggestion last term to combine all the challenges together into something like a seminar.” At Bloomberg, Greg Stohr and Allison McCartney report that although in the North Carolina case “[t]he odds are probably against the challengers,” “the Supreme Court has rarely if ever considered a map born out of such brazen partisanship, or one that produced such clear results.” In an op-ed for The Washington Post, George Will cautions the court not to “attempt something for which it has neither an aptitude nor any constitutional warrant — — concocting criteria for deciding when … excessive partisan gerrymandering becomes … unconstitutional.” At the Election Law Blog, Nicholas Stephanopolous maintains that, “[t]hanks to a number of technological and legal developments,” if the court “follows the advice of the defendants in the Maryland and North Carolina cases and holds that partisan gerrymandering claims are nonjusticiable,” “we are likely to see unprecedented abuses in the next cycle” of redistricting. At The Daily Caller, Kevin Daley looks at two scholarly analyses of Justice Clarence Thomas’ habitual silence on the bench, which the justice broke during an oral argument last week for the first time in three years. Danielle D’Onfro analyzes the court’s decision in Obduskey v. McCarthy & Holthus LLP, which held that the definition of “debt collector” under the Fair Debt Collection Practices Act does not include attorneys who effect nonjudicial foreclosures, for this blog. Opening Arguments (podcast) features a discussion of last week’s opinion in Nielsen v. Preap, in which a divided court held that a noncitizen does not become exempt from mandatory detention if, after he has been released from criminal custody, immigration agents do not take him into immigration custody immediately. The post Monday round-up appeared first on SCOTUSblog.